UPDATE #4: The event is sold out. If you were unable to secure a spot for this event online, you have the option of “flying standby.” There are usually 3 no-shows for this event, so you just might be able to get on board. Make sure to come early with exact cash. UPDATE #3: The email with my cell no. has been sent to the yes RSVPs. If you do not see my email, check your spam folder, and also make sure your email account (the one associated with your Meetup profile) and Meetup account settings allow for you to always receive messages from the organizer. If it’s not there, send me a message through my Meetup profile with your cell no. so I can text you back. PLEASE BE ON TIME, and please account for traffic delays. If you are running late, please TEXT me and let me know. Just a reminder, I’ll be the one with a bright red fox (the animal) hat on (you won’t be able to miss it), navy blue ski jacket, and white ski pants. I’ll be inside the Marketplace Food Court at Whitetail (to the right after you walk into the arch of the main building) at 8:30am to give everyone their lift tickets, meal tickets, specific-colored ribbon so we can easily identify each other on the slopes, etc. If you are renting equipment, please also fill out and bring with you the equipment rental form (see “Equipment Rental Form” section of the event posting). I’ll have extras, but it will help me out greatly if you can fill it out beforehand and bring with you. This UPDATE has also been emailed to the YES RSVPs. See you there! UPDATE #2: The early-bird price has ended and the regular ticket price is now in effect. Looking forward to seeing you there! UPDATE #1: There are fewer than 10 early-bird spots left and the price will increase when the early-bird spots are gone or by Sun. Feb. 18th (whichever comes first). To be fair to those who want to join in and are ready to make payment, I’ll be removing those that haven’t paid by Sun. Feb. 11th, then every Monday after that, then every day the final week. Make payment to *truly* lock in your spot (see the “Options” and “Payment” sections of the event posting). If you’ve already made payment, the PayPal email you received is confirmation that we’ve received your payment (no need to email me asking for ticket confirmation). This UPDATE has been emailed to the yes RSVPs. I hope to see you there! Let’s get together for a day of skiing and snowboarding! I’ve made special arrangements for us, for a day of skiing / snowboarding at Whitetail Ski Resort (a ~1.5 hour drive from DC). With a 4.2 rating on Google Reviews, many reviewers have stated this is the best skiing and snowboarding within a 2 hour drive from DC (I agree)! Sundays (the day we’ll go) are also quite a bit less crowded than on Saturdays. We are free to ski and snowboard as much oras little as we wish (resort closes at 10pm). For those that haven’t been there before, Whitetail Mountain Resort is a four season resort located on Two Top Mountain in the Tuscarora Mountains of Pennsylvania. The resort offers skiing and snowboarding on 23 trails. The mountain boasts a 935-foot vertical drop, 9 lifts, a halfpipe and two terrain parks. The resort has a western feel and is decidedly modern. I’ll send an email out to the yes RSVPs with my cell no. first thing in the morning on the day of our event. Please check your spam folder and make sure your email account (the one associated with your Meetup profile) and Meetup account settings allow for you to always receive messages from the organizer. We’ll meet inside the Marketplace Food Court (enter the arch of the main building, door is on the right in the middle of the arch) at Whitetail at 8:30am (right when they open!). I’ll be the one with a bright red fox (the animal) hat on (you won’t be able to miss it), navy blue ski jacket, and white ski pants. After we check in, we’ll be ready to hit the slopes! I’ll give everyone who signed up and made payment a specific-colored ribbon to tie on the back of your helmet or hat so we can easily identify each other on the mountain! If you have a two-way radio, feel free to bring it. I’ll have mine on me all day and set to channel 11. At 11:30am, we’ll meet in the Marketplace Food Court for lunch. At 1:45pm, let’s get together and do a group photo at the bottom of the slopes with our ski / snowboard gear on. Select lift ticket, rental equipment, and meal options below (NOTE: you must choose one of the options below to join this trip (it can just be the meal plan); $49 – $89​, depending on option selected). Day Lift Ticket Only — Good until 10pm. Retail price is $82 (taxes and fees included) per person. Our price is 40% off @ $49. Price goes up to $59 by Sun. Feb. 18th. EZ Ski Package — This package is designed for beginner skiers. This package includes a lift ticket for all beginner terrain (green and some blue rated slopes), ski rental equipment (includes helmet), and a beginner class lesson (see Lessons section of the event posting). Provides access to the following lifts: First Class Magic Carpet, U-Me Double, Lift-Off quad, and EZ Rider Quad. Good until 10pm. Retail price is $118 (taxes and fees included) per person. Our price is 40% off @ $71. Price goes up to $81 by Sun. Feb. 18th. EZ Snowboard Package — This package is designed for beginner snowboarders. This package includes a lift ticket for all beginner terrain (green and some blue rated slopes), snowboard rental equipment (includes helmet), and a beginner class lesson (see Lessons section of the event posting). Provides access to the following lifts: First Class Magic Carpet, U-Me Double, Lift-Off quad, and EZ Rider Quad. Good until 10pm. Retail price is $118 (taxes and fees included) per person. Our price is 40% off @ $71. Price goes up to $81 by Sun. Feb. 18th. All Mountain Ski Package — This package is designed for the skier who is comfortable on all terrain. This package includes a lift ticket that is valid on all open terrain, ski rental equipment (includes helmet), and a group lesson (see Lessons section of the event posting). Good until 10pm. Retail price is $132 (taxes and fees included) per person. Our price is 40% off @ $79. Price goes up to $89 by Sun. Feb. 18th. All Mountain Snowboard Package — This package is designed for the snowboarder who is comfortable on all terrain. 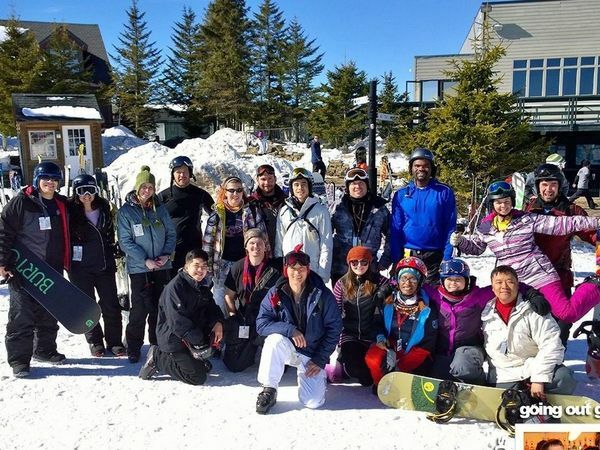 This package includes a lift ticket that is valid on all open terrain, snowboard rental equipment (includes helmet), and a group lesson (see Lessons section of the event posting). Good until 10pm. Retail price is $132 (taxes and fees included) per person. Our price is 40% off @ $79. Price goes up to $89 by Sun. Feb. 18th. Meal Plan — Save up to ~30% at meal time. Choose between five different meal options and pay only $14 per person. Note: Food options are limited at Whitetail. I highly recommend you get the meal plan. Options include: (1) Chef’s choice meal, with a fountain drink (2) Cheeseburger or hot dog meal, with fries, and a fountain drink (3) Half a sandwich and soup of your choice, and a fountain drink (4) Chicken fingers, with fries, and a fountain drink (5) Deli OR Panini Sandwich OR Salad, with bag of chips or fries, and a fountain drink. (Whitetail reserves the right to make changes as necessary). The first 35 paid sign-ups, or those who pay by Sun. Feb. 18th (whichever comes first) get the early bird price! After that, prices will go up. We have a LIMITED number of spots so make sure to RSVP early AND make payment to secure your spot and get the early bird price! To make payment, please follow the steps in the “Payment” section of the event posting. Tell your friends, come join us, and let’s together for a great day of skiing / snowboarding, new / old friends, and outdoor fun! If you need a ride, I suggest posting in the comment box below. Likewise, if you can offer a ride, please also post in the comment box with number of people you can accommodate. If you are renting equipment, please fill out and bring with you the following form. Make sure to put down “20s & 30s Going Out Group” for Group Name. Click here. I’ll have extras, but this will help expedite things upon arrival. Go to the Lesson Meeting Area (to the left of the Rental Center as you exit the building) 10 minutes before class time. Class typically lasts 90 minutes. I will have a master list of all those that have paid. It’s not required, but I recommend printing out your payment confirmation email as a backup (if you are not on the list, you will be required to show it). When you check-in, your RSVP will be listed under the name of the PayPal or credit card account used to make payment. Typically, this is your LEGAL name as shown on your driver’s license. Sometimes, it may be under a company name if you set up your PayPal or credit card account that way. If you are not sure what it is, please log into your PayPal account (it will say “Welcome, [your account name]” at the top) or your credit card account to find out. If you are RSVP’d under someone else’s payment, please use that name for check-in. Similar to a concert ticket or a football game ticket, you are free to sell / transfer your ticket to someone else if you are unable to attend. I suggest posting in the comment box for the event, that you have a ticket for sale / transfer. Work out any payment between yourselves, and have the seller only send me (the organizer) a message through my Meetup profile (do not comment in the comment box of the event posting) letting me know the first AND last name, and Meetup profile URL (if a member) of the person taking your spot (please also copy them on the message). To obtain their Meetup profile URL, go to their profile from the mobile website or your computer (not the app), and copy & paste the URL from your browser. I host a lot of events and groups, so please let me know the event name and group name the ticket transfer is for. You must let me know by the RSVP close time of 4:30am on the day of the event. Should inclement weather (e.g. snow storm, hurricane, etc.) affect our event and / or the venue(s) are not open. I’ll post an UPDATE to the top of the event posting by 5:00am on the day of our event with the details.